The Best Indonesian Coffee is a difficult thing to isolate. This is because there are several unique variants of coffee beans from Indonesia. We will provide you some of the interesting history behind coffee bean growing in Indonesia. And, we’ll break down the different types of coffee beans from Indonesia. Then, we will provide you the best of each of these categories of Indonesian coffee beans. Do You Want The BEST Indonesian Coffee Beans? Indonesia is widely known as The Island Country. A population of just over 250 million fill the over 13,000 islands that make up this country. Several of these islands are widely known for their especially flavorful coffee beans. 3.3.1 Who’s Idea Was this Anyway? Many of the islands of Indonesia were formed from volcanoes eruptions over the years. With the equator running through the middle of Indonesia, the climate in Indonesia is plenty warm enough for growing coffee beans. It even might be a little too warm if it were not for some of the volcanic elevations. We’ve seen this coffee bean formula of equator warmth combined with medium elevations work very well in other regions of the world (Colombia, Costa Rica). Ancient volcanic eruptions created many of the mountains in Indonesia. These mountains moderate what might otherwise be sweltering heat by providing morning and/or evening shade. With soil that is enriched from volcanic eruptions, the coffee trees flourish and produce wonderful coffee beans. With such perfect agricultural farming conditions, it’s not a surprise that the Best Indonesian Coffee Beans are some of the most sought after in the world. With the perfect climate and rich soils in Indonesia, it’s not surprising that we find great coffee from this far eastern side of the world. What is the most surprising is that there is such a diversity of coffee beans flavors. All of them from this prolific coffee bean country. We’ll now go into each of the most popular categories and discuss what makes them unique in their own way. Bali is famous as a vacation destination. But, many don’t know until they get to Bali, that they also provide a unique brand of coffee beans. Bali is part of a larger group of islands called the Lesser Sunda Islands. The other two major islands in this group are the East and West Nusa Tenggara islands. However, Bali provides the most coffee farms between the three Lesser Sunda Islands. The highest mountain in Bali is Mount Agung at an elevation of 9,944 feet at its peak. The northern side of this mountain is the primary location where farmers grow coffee beans on Bali. Although, some plantations cultivate coffee beans on the nearby Mount Batur. The beans grown in Bali are typically Arabica. Coffee farms on Bali often use wet processing to harvest their coffee beans. Although, a few Bali producers do still go with dry processing (typically leaving the coffee bean inside the coffee tree fruit during the drying process). The wet processing method used in Bali produces a brighter acidity and a more high-toned flavor. This distinguishes it from the coffee beans produces in the neighboring Indonesian islands. Flores is one of the newer locations in Indonesia that is producing coffee beans. Beans from Flores used to be blended with beans from other origins. However, recent crops have produced a very high quality bean that has unique and bold flavors. These new beans produce a heavy body that mixes in notes of sweet chocolate. Some include floral notes like tobacco, or woody notes. The result is quite unique and has drinkers finding this origin to be rising in popularity. One of the most productive regions in Flores is on the slopes of Inerie Mountain. The Bajawa district to the north produces an up and coming Arabica Flores Bajawa (AFB) coffee bean. And, the neighboring district of Golewa along the Eastern side of the mountain is another area where coffee beans florish. The island of Java contains more than half of the population of Indonesia. In fact, the island of Java is the most populated island in the world! Even more than Honshu, the main island of the very populated Japan. Java is the 2nd most densely populated island in the world with approximately 140 million people (a 2014 estimate) living on average of 1,117 people per kilometer. What is crazy is Java is almost twice as dense as the third place island of Taiwan. But, is no where close to the unbelievably dense island of Salsette in India coming in at 24,414 people per kilometer! I have no idea how anyone gets on or off the island of Salsette. Google Maps puts Salsette Island in the middle of a mountain. But, pictures seems to show that the only way onto the island is boat. But, back to Java island. At the eastern end of Java Island is the Ijen Plateau. At the top of this mountain is one of the great views in the world. The picture I found doesn’t do it justice. But, this was the best of the pictures I found that was not copywrite protected. Use this link to view some more amazing pictures of this natural phonomenon. I don’t think you will be disappointed. The majority of the coffee from Java comes from these five planations. So, if you are having a hard time finding coffee beans from Java Island, try searching for each of these names. Papua and West Papua are part of the 2nd largest island in the world. That island is New Guinea and Greenland is the only other larger island. The island is inhabited by two countries. The western half is Indonesia. The eastern half is Papua New Guinea. The Indonesia half is split between the two provinces of West Papua (or Papua Barat) and Papua. The Papua name is a fairly recent name in historical terms. The Papua province adopted the name Papua in 2002. The mountain Jayawijaya (formerly know as the Orange Range), reside in the central highlands of Papua and provide the agricultural climate that allows Papuan coffee beans to be grown. The town of Wamena resides in the Baliem Valley beneath Jayawijaya mountain. A second farming area is further east in Papua province. The Nabire region is the home of the town of Moanemani where rural farmers grow coffee in the valley of Kamu. Both of these locations are in some of the most remote regions in the world. The farmers have very few roads into and out of these farming areas. A new coffee bean company called Koperasi Serba Usaha Baliem Arabica is starting up in the region and is attempting to bring in Fair Trade practices to help farmers of Papua get better pricing for their coffee beans. Coffee beans in this region are primarily shade grown. Because these farms are so remote, modern world pesticides and herbicides are just not even known to these farmers. This makes these coffee beans very organically grown when compared to any other coffee bean in the world. The coffee beans in Papua grow at elevations between 4600 and 6600 feet. Like all Indonesian islands, the volcanic history provides soils rich in minerals. As we’ve found in countries like Colombia and Costa Rica, these conditions provide a perfect combination of agricultural benefits for growing coffee beans. Coffee beans grown in Papua generally results in an Arabica bean that brews with a heavy body. Coffee bean notes from these regions are found to include some chocolate flavors, an earthy tone, and a spicy finish. The people of Papua make some of the best Indonesian coffee anywhere. Most of the coffee beans grown in Sulawesi Indonesia grow on the slopes of the mountain of Latimojong. Sulawesi was formerly known as Celebes and is the Indonesian island just north of Flores. Toraja people are a community of folks that grow the coffee beans in Southern Sulawesi. The Toraja are indiginous to the Southern Sulawesi province. These tribal folks converted their crops from rice and maize to a more profitable coffee crop in the mid 19th century. The Toraja people are a very ritually oriented group of people. Their coffee bean processing is called giling basah. It is a form of wet hull processing that has become a ritual for them. Coffee beans in Southern Sulawesi are grown between 3,000 and 6,000 feet on the slopes of Latimojong. Almost all of these crops are harvested and trade through the small town of Kalosi. Kalosi has grown to become a specialty coffee brand name in the coffee industry over the years. There are a few other regions in Sulawesi that grow coffee. You can look for the names of Mamasa and Gowa to name a couple. We save the best for last with Sumatra Indonesian coffee. Or, at least the most popular. Sumatra is one of the most western of the large Indonesian islands. It is just northwest of Java and is the largest of the Indonesian islands that is completely under the Indonesian flag. The other larger islands that are home to Indonesia are split with other countries. As you might expect with Sumatra being such a well known name in coffee, coffee production in Indonesia is led by Sumatra. Coffee in Sumatra is also processed using giling basah. This process first removes the outer cherry skin using locally built pulping machines. The coffee beans, still coated with a pulp like substance called mucilage are stored for up to one day to allow the mucilage to separate from the coffee bean. After a day or so, the mucilage is washed off leaving mostly the coffee beans. These beans are then partially dried and sold to coffee bean companies. The coffee bean companies can then do additional post processing (more drying), or just roast them to their liking. Lintong is a city just southwest of Lake Toba where large quantities of Sumatran Arabica coffee beans are grown. The Lintong name has grown to be able to stand on its own as a brand of coffee beans. The giling basah processing gives Lintong coffee beans heavy body with low acidity. Lintong is also known to grown a relatively rare variant of coffee bean called Linie S. This coffee bean differs from the more popular Arabica and Robusta in that it is more resistant to disease and provides a more consistent level of production. Mandheling is actually a group of people in northern Sumatra. The name has become a trade name for coffee beans from northern Sumatra. Mount Gayo is towards the most northern part of Sumatra. On the highlands on the north side of Mount Gayo, farmers grown Gayo coffee beans under shade trees in and around the town of Takengon. The giling basah style of processing in Gayo produces higher tone and lighter body coffee. Many consider this wet processing to be one of the reasons that the best Indonesian coffee is some of the best in the world. Sidikilang coffee beans are grown just north of the large lake Danau Toba. Similar processing methods to Gayo produce coffee beans with similar quality as Gayo beans. Below we have searched and found the best coffee beans from each region of Indonesia. We only included coffee beans from a region if the coffee quality was up to our stiff standards. So, don’t think we just threw one in to make sure we have a product for each Indonesian island. If you are seeing a product below, it is not only high quality, it is representative of the area it is listed in. Our research led us to this very high quality coffee bean sourced from the Kintamani Highlands in Bali, Indonesia. These are the best Indonesian coffee beans we could find from Bali. These beans are harvested from coffee bean farms on plateaus near Mount Batur at an altitude of approximately somewhere between 4,200 to 5,600 feet. These beans are 100% Arabica beans. These are advertised as medium roast coffee beans. There seems to be a disagreement about the roasting levels. So, possibly FRC is not providing a consistent roast. The more likely reason is that people think they are a medium roast drinker, but they sometimes over estimate or under estimate their ability to drink a darker or lighter roast and incorrectly diagnose a properly roasted cup of coffee.. The Body is described as Bold by Fresh Roasted Coffee. Drinkers describe it as having a Full body. During our research, we found these to be the best Indonesian coffee beans from Flores. 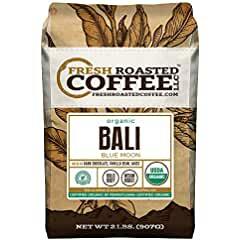 Fresh Roasted Coffee LLC comes in again as a high quality option for Indonesian coffee beans. We’ve featured Fresh Roasted Coffee before for other regions, and they have often provide high quality products. They appear to have found some great options in Indonesia and are providing great products from this region. 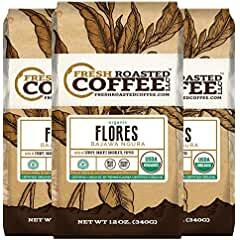 These Fresh Roasted Coffee Flores Bajawa Ngura beans are 100% Arabica coffee beans from the Flores district of Ngura. While you find a fair amount of Islam in this region of the world, Bajawa turns out to be a hot bed of Catholicism. Bajawa is near one of the more popular tourist attractions of Flores, Indonesia. That attraction is Mengurada Hot Springs, which is a spring that runs from Mount Inelika down into the city of Bajawa. These springs are rumoured to have healing properties that can cure varoius skin diseases. The water runs down from volcanic sources that provide sulfur and volcanic minerals from the earth’s magma. The water get very hot coming from these volcanic sources. But, tourists say that although you feel like your boiling at first, that your body quickly adjusts and that the experience is extremely relaxing and pampers your sore muscles after a long day of touring the island. These Bajawa beans have an earthy notes with hints of Baker’s chocolate, pepper, and syrup. Some drinker are finding these beans a little less complex than the Bali beans we talk about above from this same company. They are organic beans. Just like other parts of Indonesia, farms in these remote regions just haven’t advanced (digressed) enough to even know about pesticides and herbacides. These Bajawa Flores beans roast to a medium level and produce a mild body. We had a difficult time finding the best Indonesian coffee from Java. The main reason was that this is the home of the Kopi Luwak civet coffee beans. This coffee is famous for being the most expensive coffee in the world. However, what we’ve found out during our research is that greedy farmers have tried to beat the system by capturing and force feeding the palm civet creatures. What this does is completely against what Kopi Luwak coffee is all about. The reason that Kopi Luwak became so famous and so exclusive is that the palm civet animals of Java Island’s Ijen Plateau acted as the crop pickers for the coffee beans grown in the area. Since the palm civet was very picky about what coffee beans it ate, the palm civet would eat only the very best coffee beans. The palm civet would then digest and excrete the coffee beans. The palm civets would hardly chew the beans leaving them in pristine condition. What is the most difficult to believe about this story is how any human ever came up with the idea to clean and roast these coffee beans since they are basically the excrement of the palm civet. 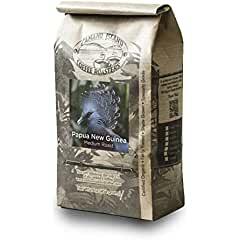 But, someone was brave enough to give this a try, and it turned out that because the palm civet is so selective, the resulting product only includes the very best quality coffee beans. What is happening now is that greedy farmers are capturing and containing the palm civets to mass produce the very expensive Kopi Luwak coffee. Why this is very bad, is for several reasons. First, the animals are treating extremely poorly by many of these farmers. Second, the palm civet isn’t able to roam and use it’s very selective abilities and pick the very best quality coffee beans. So, many of the coffee beans from Java are not only a social nightmare for anyone with animal anti-cruelty leanings. But, even if you don’t care about any of that, the coffee beans aren’t going through the proper palm civet coffee bean selection process, so they really do not warrant the high price. For this reason, we can’t really verify that any of the palm civet coffee is being collected using truly wild palm civet excrement. So, we are going to pass on making a recommendation for the best Indonesian coffee from Java. For the island of Papua, this Camano brand is our best Indonesian coffee from Papua. Camano Island Coffee Roasters started their company in 2000 by establishing fair trade agreements with coffee bean farmers in Guatemala. From the beginning they focused on shade grown (to protect bird habitats) and organic (to protect you) agricultural farms as a part of their focus to bring a better and more socially aware product to the market. They have expanded to the Indonesian region with this Papua New Guinea Medium Roast product. These beans are grown in the New Guinea Highlands in the Papua province of Indonesia. Originally, these plants were transplanted from the Jamaica Blue Mountain region that is famous for very high quality coffee beans. These coffee beans come advertised as a medium roast. Drinkers found this to be true, with some indicating that the roast was on the darker side of medium. Camano describes these coffee beans as providing a sweet medium body. Drinkers were not commenting on the body very much and one was not a fan saying the body was almost non-existent. Drinkers found this to be a very low acid brew that is very gentle on the stomach. Even those with chronic acid reflux problems found this coffee to be a good complement to their morning without complications. From a flavor standpoint, many find this to be a sweet cup of coffee that is smooth without any bitterness. Some found the aroma to have a subtle floral Asian spice appeal. Some found a slight chocolaty note to the flavor. Sulawesi’s entry for the best Indonesian coffee beans comes from the folks at Coffee Bean Direct. We have featured Coffee Bean Direct in several of our coffee categories. So, it is no surprise to us that they came out on top for Sulawesi coffee beans. 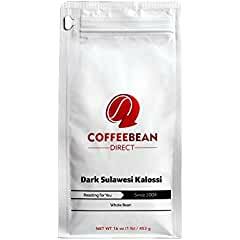 Coffee Bean Direct Dark Sulawesi Kalossi coffee beans are grown in the small town of Kalossi in the Toraja mountains. We talked a little earlier in this article about the Tarajan native people that practice the wet processing ritual called giling basah. These beans are dark roasted without any of the bitterness you often find in other dark roasts. This dark roast delivers a rich full body that is lighter than you might expect from a French roast. The acidity is low to mild with a sweet taste. Sumatra is probably the most famous brand in Indonesian coffee. At least until some of these other islands start to gain in popularity (as they are). Our entry for the best Indonesian coffee from Sumatra comes from Lavanta Coffee Roasters. 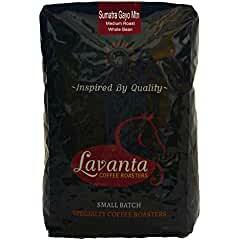 Lavanta Coffee Roasters is a small second generation family owned coffee company. They takes an extra interest in purchasing from woman farmers in an effort to promote woman that are working in an industry that tends to be dominated by men. Lavanta also works with farmers in a way they call “direct trade”. This is a similar concept to Fair Trade coffee business, with the exception that they work directly with the farmers to ensure quality, consistency, and healthy environmental practices in return for a fair price for the beans. Lavanta Coffee Roasters Sumatra Gayo Mountain Mandheling Medium Roast grows on the slopes of Gayo Mountain in Sumatra. We talked earlier how Mandheling is the name of a group of people in Sumatra. The Mandheling people participate in the farming concept of giling basah. This is the wet processing method that produces such a unique flavor. These beans are delivered in a special bag that supports the one-way release of expanding coffee gasses. These gasses fill the bag because the beans have been freshly roasted and are still releasing gas as they are shipped to you. These are 100% Arabica coffee beans that are roasted to a nice medium level of roast and has earthy cupping notes. We hope you enjoyed our journey to the island nation of Indonesia. A lot was learned about some of the beauty of this far Eastern nation. We also did learn a lot about what it takes to make the best Indonesian coffee. If you decide to give any of our featured coffee beans a try, please don’t hesitate to leave a comment and tell us what you thought. Also, if you enjoyed our journey please click on the social button on the left of your choice and share. Let us know if you agree with our choice of the Best Indonesian Coffee. I tried the Sulawesi Kalossi you recommended. And, I LOVED it! I had never tried coffee from Indonesia. So, I was curious. Now it’s one of my favs. When I’m finished with this CBD coffee, I’m going to give one of these others a try. Thanks for the comment. I love it when a recommendation gets positive feedback!